The distinctive arched gateway at Auschwitz II-Birkenau. The largest institution in the Nazi Final Solution was Auschwitz, in southern Poland. Today the word Auschwitz transcends language barriers and conjures up images of death, suffering and misery. At Auschwitz, human beings revealed how brutally they could treat each other – and how efficient men can be at orchestrating and carrying out acts of mass murder. Auschwitz was little more than a factory of death. Millions of Jews and other minorities entered its gates, never to return. As they entered they travelled under a metal banner bearing the cynical promise Arbeit Macht Frei (‘Work makes freedom’). The chilling reality of Auschwitz was that work and time only made inmates closer to death, either by starvation or disease or in Auschwitz’s grotesquely efficient gas chambers. Even today historians debate and dispute the death toll at Auschwitz, with figures ranging from 1.1 million to more than three million. The only concrete fact is that Auschwitz was a place of absolute murder. Auschwitz I was the main administration centre or ‘headquarters’. At 60 square kilometres, it was the smallest in area of the three main camps. Auschwitz I was also the location where SS doctors such as Josef Mengele conducted medical experimentation on inmates. This included scientific testing on infants, twins and dwarves; forced castrations and sterilisations; studies on blood transfusions and replacement; and experiments involving hypothermia, oxygen deprivation and drowning. Auschwitz II-Birkenau was the main extermination facility of the Auschwitz complex. It began construction in October 1941 and was complete by mid-1942. 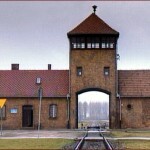 Auschwitz II was the first camp to have a gas chamber and crematorium installed. As the number of Jews and other inmates escalated through 1942, and the Nazi hierarchy demanded greater efficiency in disposing of them. Crematoria II was constructed in early 1943 and Crematoria III, IV and V were all in operation by June. The majority of victims at Auschwitz were killed after mid-1943. 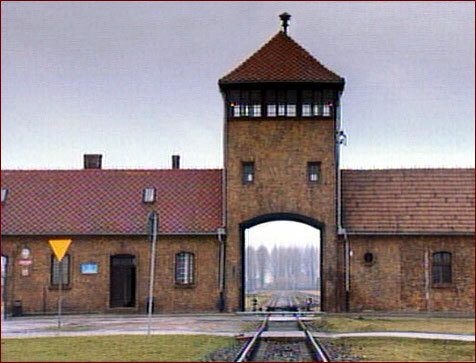 Auschwitz III-Monowitz, the largest of the three main camps, was constructed in October 1942. It originally housed inmates who were slave labour workers in a nearby rubber factory. Up to 40,000 inmates lived at Monowitz in horrific conditions unfit for animals. Nazi physicians frequently attended Auschwitz III to conduct ‘selections’, or mass inspections of inmates for health, strength and mobility. Those fit were work were retained; those who were not were transferred to Auschwitz II-Birkenau for extermination. Prisoners were transported to Auschwitz from almost every country occupied by Nazi Germany. They came from all corners of Europe in cattle cars, with no toilet provisions and no access to food or water. As the wagons arrived at Birkenau and passed under the distinctive archway, prisoners were subjected to ‘selections’ by Nazi doctors. The majority of first arrivals were sent away for extermination, which the Nazis euphemistically dubbed ‘evacuation’ or ‘special treatment’. Children and elderly people were almost invariably exterminated on arrival because the SS considered them incapable of work. Only the fittest adults were retained for labour. Those selected for extermination were usually informed that they were to be showered and de-loused. They were ordered to remove all clothing and leave any belongings, including spectacles and shoes, for collection at a later time. Their heads were then quickly shaved, their hair retained for military uses. They were ushered into specially designed rooms, the walls lined with concrete, the doors and windows with airtight seals. There was a single vent for the distribution of poisonous gas and a single small window, allowing guards to check for signs of life. The deadly gas used at Auschwitz was called Zyklon B (German for ‘Cyclone B’), a cyanide-based pesticide manufactured by the German company IG Farben. When this was in short supply, prisoners could be suffocated with carbon monoxide by filling the chambers with truck exhaust fumes. Most gassings took between 20 and 30 minutes. Once the victims were observed to be dead, they were checked for and stripped of gold teeth. The bodies were then hauled into nearby crematoria for burning. The work of moving, lifting and loading bodies into the crematoria was carried out by Kapos (specially selected prisoners). The Kapos carried out this sinister work for a few extra food rations or to ensure their own survival. Those inmates selected for work at Auschwitz were tattooed with a prisoner number, usually on the inside of their forearm. They were no longer addressed by name but by this number. Work details lasted twelve hours with no breaks. Kapos were posted in toilet areas to ensure no prisoner spent too much time away from work. Prisoners at Auschwitz wore light-blue striped clothing without underwear; on their feet they wore poorly-fitting wooden clogs, without socks or stockings. Roll calls were conducted at least twice: before and after work details. If a prisoner was missing, other prisoners were forced to stand in formation until the person was found, regardless of weather conditions. Upon returning to their barracks, the prisoners received rations of bread and water. After months spent as a labourer at Auschwitz, many inmates became what the German guards called Muselmann – fatigued and starved, they moved silently like zombies, barely conscious of their surroundings. Because the camp was a great machine to reduce us to beasts; we must not become beasts; that even in this place one can survive, therefore one must want to survive, to tell the story, to bear witness; and that, if we want to survive, then it’s important, that we strive to persevere at least the skeleton, the external shape of civilisation. Towards the end of 1944, with the Soviet Red Army rapidly approaching, the SS officers at Auschwitz received orders to murder the remaining inmates and destroy evidence of what had happened there. But time was running out so it was decided to evacuate 60,000 prisoners to Bergen-Belsen, another concentration camp closer to the German border. The prisoners were forced to march west; of those who left Auschwitz, only 20,000 made it to Bergen-Belsen. Approximately 7,500 prisoners were too weak to march and were left behind at Auschwitz; those of them that survived were they were liberated by the Soviets on January 27th 1945. The Russian soldiers who liberated Auschwitz found enormous stacks of personal artefacts confiscated from murdered prisoners. One storeroom contained almost 350,000 men’s suits; another was filled to head height with shoes, spectacles and human hair; others were filled with stolen photographs, personal papers and jewellery. And of course, there were piles of human corpses, in various states of decomposition or cremation. The grounds and forest around Auschwitz were ankle-deep with ash, deposited like rain by the giant brick chimneys of the crematoria. Gullies, ditches and ponds, used as dumping grounds for crematoria waste, were clogged thick with ash and bone fragments. Even the men of the Red Army, hardened by war and accustomed to death and suffering in their own country, were moved to tears by what they found. 1. Auschwitz, in southern Poland, was the largest and deadliest concentration camp in Nazi-occupied Europe. 2. Selected for its centrality in location to European rail networks, it received prisoners from almost every country. 3. Auschwitz was actually three main camps and 45 sub-camps; Auschwitz-Birkenau was the deadliest of these. 4. Inmates arriving at Auschwitz were ‘selected’ for either work or immediate extermination, based on their fitness. 5. Auschwitz was liberated by Soviet Russian soldiers in January 1945, with only 7,500 sickly inmates still there.